In highly charged, dazzling language, 4:30 Movie explores a sister’s death and the ways movies shape our imaginations. 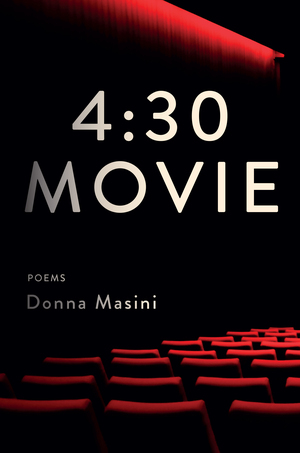 In poems that are by turns intimate and wild, provocative and tender, award-winning poet Donna Masini explores personal loss, global violence, and the consolations of art. She brings her wit, grief, fury, and propulsive energy to bear on the preoccupations of our daily lives and our attempts to bargain with endings of every kind. Equal parts lament and praise, 4:30 Movie is fueled by despair and humor, governed by the ways in which movies enter our imaginations and frame our experiences. The movie theater becomes a presiding metaphor: part waiting room, part childhood, part underground depths where the self is a bit player, riding the subway with “its engine of extras.” Masini's exquisite wordplay shows the mind wrestling ferociously to forestall grief, as if finding the right words might somehow allow us to extend our beautiful, foreshortened run.